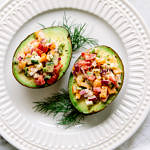 Stuffed avocados anyone? Both festive and fun, they make for a great snack, side or light meal. Enjoy the various ways to stuff your avocados! Prepare the ingredients. Once you’ve sliced the avocados and removed the seeds, squeeze or rub a little lemon juice on the flesh to keep the browning at bay. Place the tomatoes, cucumber, bell pepper, jalapeno, onion, and garlic in a small/medium mixing bowl, add just enough of the hummus/tahini/vegan mayo to bind. Fill avocados and top with salt, pepper and squeeze of lemon. Try adding in some freshly chopped herbs to your mixture. You may consider a little dill, oregano, basil, cilantro, etc. For versatility, try stuffing your avocados with this Greek Chickpea and Quinoa Salad as shown above. Alternately, you can also use this mock tuna ‘Chickpea of the Sea’ Salad or classic Mashed Chickpea Salad. Nutrition information is for the use of 3 avocados.